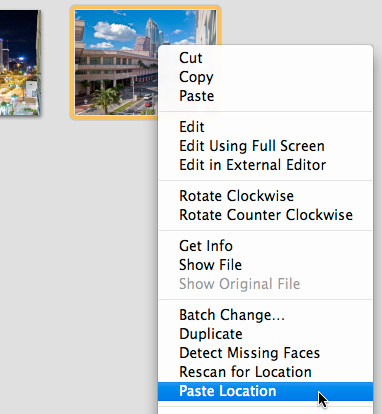 One of my favorite new features in iPhoto 8.0.2 is the ability to copy geodata from one image in your library and paste it to another. The process is easy, but it isn't necessarily intuitive. Here's how it works. First, select a photo that has the location data that you want by clicking on it once. 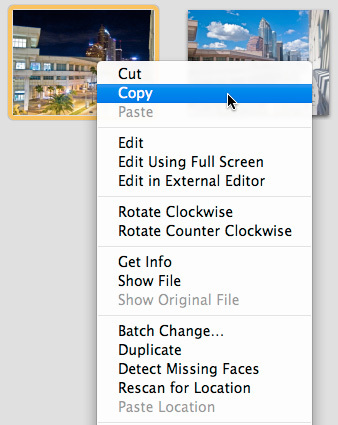 Then, right-click or CTRL-click on it and choose Copy from the contextual popup menu. Then, go directly to the image that you want to add the data to, right-click on it, and choose Paste Location from the contextual popup menu. You can confirm the success of this by choosing Get Info (click on the little "i" in the corner of the photo), or by looking at the extended metadata for the image (Option - CMD - I) -- you should see Latitude, Longitude, and Place information. You can create Smart Albums to sort images that have geodata from those that don't. Just go to File > New Smart Album, and choose "Photo - is not - Tagged with GPS" as your conditions. This will create a Smart Album with all of your untagged images. Then, if you want a companion album with tagged photos, just create a new Smart Album with "Photo - is - Tagged with GPS". Now you can easily copy location data from tagged images and apply to untagged ones. Macworld Magazine Article (by me): "Geotag your photos on-the-go"
1. Can this data be written to the 'original' image file? My previous experience with iPhoto suggests that it only writes metadata to file if you export as something other than original. For example, if you have a JPEG, you have to export as JPEG (rather than 'original') which reencodes the file and reduces quality. 2. If you can write this Geo metadata to the original file, does it preserve any pre-written pre-existing metadata (e.g. IPTC written from another application)?